Our next step in the process was to figure out how we were going to keep those bales moist, and keep our plants hydrated. Now… we thoroughly enjoy getting out in the yard… with a glass of wine, and holding the hose to the garden. The old soul in us that is still a bit naive’ believed that this would be the route we would choose. However, confession… we are also lazy. So, it was inevitable that in order for this all to work, we were going to need to install some sort of irrigation system. Whether it was a sprinkler of some sort, or a soak hose, it was going to need to happen. 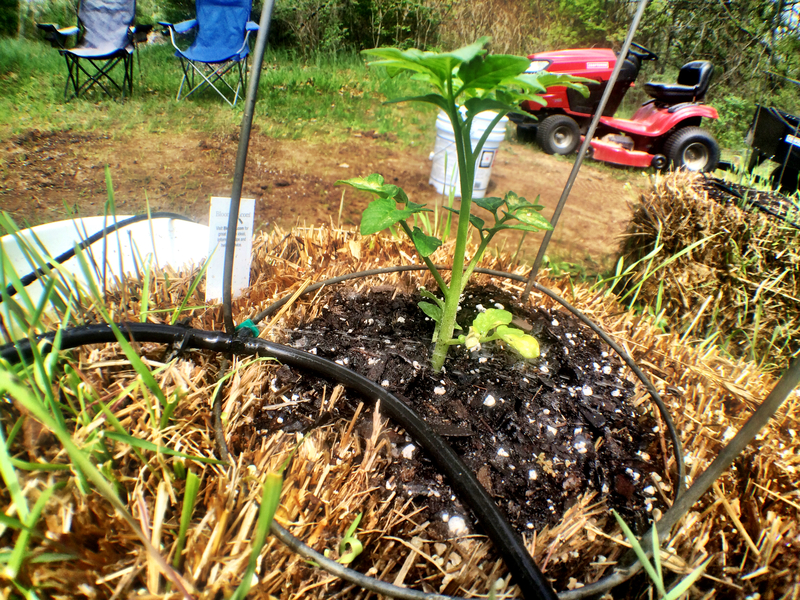 Fortunately, all the talk of attempting a strawbale garden peaked some curiosity among our friends… one of which is a good man name Zeke, who had a drip system available to us… for FREEEEEEEE…. So… when offered, we said yes. Neither one of us have ever had any experience with a drip system… so… it was off to YouTube we went for an education. It seemed simple enough. And we like that. We ended up being given more than twice of the equipment that we needed, and it took us about an hour to get everything installed in such a way as to make us feel like we had this really high-tech operation set up over our strawbales. After everything was set up… we turned on the spicket… and were thoroughly impressed from the word go. Water was being delivered to the exact locations we wanted it to be… in a slow enough manner that we can turn the hose on, and leave it for a few hours. By our calculations… each bale is receiving about a gallon and a half of water every 30 minutes. So… we will calculate our needs based on the climate and needs of the plants. We will also be able to make adjustments for the plants that are a bit more hungry for nutrients as the summer months come along. We will post our findings in the days to come. So… that is where we be in the process. Check out the video for a multi-media demonstration.